AFC Bournemouth finished 2018 with a 4-1 defeat at Manchester United, the home side's attacking force too much for the Cherries at Old Trafford. The hosts took an early lead when Paul Pogba was on hand to turn home following some terrific Marcus Rashford wing play and the French midfielder scored a second ten minutes before the break with a header. Rashford added his name to the scoresheet a minute before half-time but there was still time for Nathan Ake to give the Cherries a lifeline on the stroke of half time with a superb header, 3-1 the score at the end of an action-packed first period. Romelu Lukaku stepped off the bench to net a fourth - which was shown on the replays to be offside - for the home side before, with ten minutes left, Eric Bailly was dismissed for the Red Devils for a bad foul on Ryan Fraser. With limited time remaining the Cherries couldn't make a further scoring mark as they fell to defeat. With injuries stretching Eddie Howe's squad, Jordon Ibe returned to start at right wing-back, Charlie Daniels moved into the back three and Diego Rico came in for his first Premier League start since September. United were quickly out of the traps and with their first attack they opened the scoring. Rashford was the architect as his precision on the right touchline allowed him to elude Ake and then Rico before he played the ball across the six-yard box for Pogba to leap in and convert. While the home side always looked an attacking threat - illustrated by a stinging long-range Pogba shot held by Asmir Begovic - the Cherries were beginning to have the better of things and Joshua King's smart centre looked certain to be turned home by Junior Stanislas before Ander Herrera intervened. However, Pogba soon ghosted in to score his side's second. Herrera delivered a teasing ball from the right apex and the Frenchman beat the 'keeper to the ball and glanced his header home. Ashley Young was perhaps fortunate to see only yellow for a high challenge on King close to the byline and the Cherries' Norwegian front man soon tested David De Gea's reactions at the near post with an angled drive. United had a third closing in on the break, Rashford this time the scorer as he was able to slide to finish an intelligent Anthony Martial cross. Ake gave the away side a slither of hope for the second half when he headed home after some good work in the box from David Brooks following a corner, the Welshman stepped past two men before cutting back his cross which Ake flicked home at the near post. Back out for the second period attacking the Stretford End, the Cherries were continuing to ask questions, King finding room in the box but unable to get his shot away. A Steve Cook charge led to the defender delivering an excellent cross, met by King with only a last-gasp Bailly block stopping what looked likely to be a visiting second. From the resulting corner Bailly cleared but left a studded imprint on Daniels with his shoulder-high boot, referee Lee Mason adjudging there was no infringement. Away hopes of a comeback were lengthened when substitute Lukaku poked home with virtually his first touch, though the Belgian appearing to be offside as Pogba's high ball fell into his path. The home fans making their most noise of the game, Begovic produced a brilliant save to push a skidding 22-yard Pogba shot onto the post, before Bailly received a straight red after he recklessly dived in on substitute Fraser near halfway. 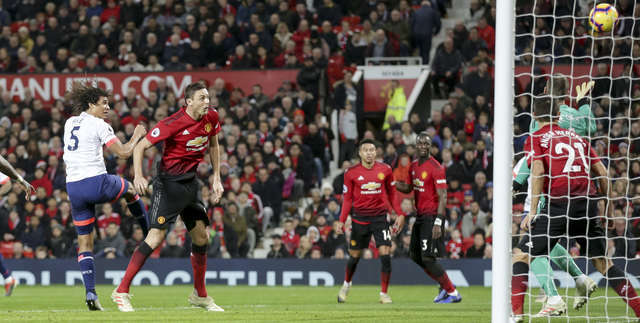 Andrew Surman curled a shot a yard wide as the Cherries looked for a late goal, but ten-man United were able to see the game out by putting their foot on the ball and restricting possession for the visitors. For long spells the Cherries looked comfortable in the game, but while they got into good positions at Old Trafford good areas were always going to be needed to be taken full advantage of. Similar as to with Tottenham at Wembley on Boxing Day, United were able to finish off their chances with their attacking players able to make the most of glimpses in attacking areas and score the goals that ultimately took the game away from the visitors in the first half. A huge player for the Cherries, Ake was clutching his hamstring after 47 minutes, with fans hoping it was nothing serious. He was able to play on and while not looking 100 per cent, he soldiered through, gesturing to the bench that was OK at regular intervals. At 4-1 however it did provoke the manager to bring the Dutch defender off - the afcbTV team will ask the manager the latest on him in his post-match interview.